The Micro Scalextric braids do need some work. I agree with El Camino that softer copper braid is better than the stock stuff. One of our WHO racers, Andrew, tested a wide range of different 1/32 manufacturers' braids and - I think - found that thin, but not too thin racing braid works the best. At least that's what I took away from his findings. Andrew also looked at running the braid shorter than standard - that is the same length inside, but shorter on the track side. Andrew also tried *very* short braids to completely neutralise their lateral movement, but I seem to remember that caused other handling and conductivity issues. I tend to go a little shorter and, once the braid is fitted, I 'scrunch' it up slightly. That is, I push down and forward on the end of the braid - it opens up the weave, making it a little thicker, shorter still, but gives it better 'structural integrity' with less lateral movement. Finally, I 'tease' the end of the braid as Ed described - that is good for any braid on any track. The most important thing - of course - is not to crash! An off is the #1 reason for lateral movement of the braids. We did run Micro cars at our school holiday team endurance races for several years. The issue with braids was treated as part of the challenge and placed importance on a steady pace and avoiding crashes. It also made strategy important - you might want you best driver on first to run the car with perfectly tweaked braids. Also whether you made routine pit stops for a regular braid adjustment or wait until your really needed it. That's fine if you are running only Micro cars. However, Andrew and his daughter Hannah successfully ran Micro cars in our Formula One class at WHO, appearing in several A finals and Hannah winning junior medals - that's against Mega-Gs and Tyco 440x2s - and Andrew picking up the F1 Classic Cup competition, his Micro beating a number of good Tycos to the title. I know Andrew races the Micro Scalextric chassis exclusively, and always thought that was cool. He has a great collection of them as well. I'm not trying to beat on the cars. I've mentioned several times in this thread that they ARE quick. I'm not surprised that they can compete when in the hands of someone who knows the cars inside and out. We have always had fun when racing them too, but it always becomes more like a demolition derby with a higher percentage of crashes and pile ups than usual. I imagine they perform much better on MS track with the wider rail that is flush with the track surface. The top heaviness of the Mini Cooper body probably doesn't help either, but since we use them as IROC cars, everyone is dealing with the same issues and it all evens out. Despite the shortcomings of the braids, I still love my Mini Coopers! Misaligned braids is why I advocate using a Slide Guide, or a similar product for the cars. A pivoting guide allows the pickup braids/wire to stay straight even when the car drifts in a corner. This has been the solution used by large scale slotcars since forever. HO is the only scale where pivoting guides are not used. But if you want to join the rest of the world and install pivoting guides, you have options, regardless of whether you want to race commercial chassis or fabricate your own. There are solutions out there. Last edited by HO RacePro; 03-26-2019, 07:35 AM. Lets back up a smidge. Handling-wise, consider the difference between a toboggan and a snowmobile .Comparing a non-adaptive pick up arrangement like the Scaleys, to fully adjustable, sprung shoes has the apples co-mingling with the oranges, and thats why you have fruit salad in the turns. Dissociating the electrical contacts from the blathering inputs of the surface, the rails, and the guide/slot is huge on sectional. It's quite another matter on a routed track using braid or continuous rail. How adaptive the setup ( read travel) WITHIN the design must be, is directly related to the accuracy of the surface, rails, and joints. The cottage industry H0 manufacturers have literally rode the scale down the rails. It's what Ed is always driving at. You dont need all the extra chassis malarkey if you build a smooth, carefully executed track. Slotcars in other scales have functioned beautifully for decades on unsprung pick ups. They launch better, coast better, and they have a completely different feel. Ultimately hard shoes are for knife edged rail, braids are not. It can be done, however the expectation that the service interval is considerably shortened must be accepted. I'm not advocating anything in particular, I have sectional and run braids on a lot of cars. My rails were honed and the joints massaged to accommodate them with less shredding. I just accept the physics and change my braids more frequently. MM -- I'm not sure I understand your above post. Pivoting guides, with braids or pickup wires work just fine on sectional track as well as routed track. They are no more upset by the track joints than any other pickup system. What screws up braids is when they are mounted directly on the car -- like they are on Micro Scalextrics. If the car drifts or spins out that tends to twist the braids sideways, which will need to be fixed before the car runs properly again. Sectional plastic track is tough on any pickup system, because the sharp ends of the power rails can catch and gouge the pickups, especially when the track sections aren't quite level to each other. And the narrow tops of the power rails tend to cut into pickups. But that doesn't mean braids won't work. Yes, routed tracks are smoother and are easier on the pickups, whether rail, braid or copper tape. I don't think anyone argues that. Heck, all track systems are compromises. Routed tracks are a joy to run on, but sectional tracks can be changed around, which routed tracks typically can't. Vive la difference! A routed track could be modular, I don't recall ever seeing a modular HO track, but my 1/32nd club has two of them. I am a massive fan of the N20 motor too, so I wish you luck with this. The issue is, though, will you be able to order another 100 in 2 years time, to the exact same spec? I have not been able to do so to date, and I believe others have tried, such as Rich. The only dependable supply I know of is the Mega-G+ units, but one has to buy a rolling chassis to score one. I did get three of the motors that Ed mentioned. The service was very good by the way, however it looks like there might not be many left. I only have one car that uses a motor that big, it is a Riggen, my other cars use smaller motors. I have been able to get those specific motors on eBay and Amazon, in small quantities, for well over a year. I just received three this week. They may in fact be out of production, but that could change tomorrow if someone decides to write another check. It is pretty much like anything else in slot racing -- parts availability changes over time. I hate to think of all the stuff that has been marketed over the decades that is no longer available, or simply made obsolete by advances in technology. When I visit a slot car show it nearly brings tears to my eyes. Why I picked on N20 is that it is a packaging geometry that has become an industry standard, and also happens to be suitable for HO scratch-building. (Gerry Cullan has proven that in spades!) The can size is fixed. How it gets stuffed is all over the map. Not a whole lot different than the 16D and 24D motors in larger scales. And like those 'D' motors, if you want a particular armature wind, brushes and magnets, all you have to do is put the spec out to bid. Have the vendors quote you the quantity price breaks and a delivery date. You may have to order 10,000 to get a good price, but maybe they'll also quote you only 1,000 at a considerably higher price per unit. Thing is, you might be able to get those 10,000 units at less than a buck apiece. You might be interested to know when I bought the tooling to make the Slide Guide it cost me about US$7,000. And that was in the early 1990's -- about a quarter-century ago. So becoming the Motor King of HO slotting may not be out of reach, even for a private hobbyist. I might also mention that I sank more than $2,000 recently for a production run of "Braiders" which I've decided I can't sell. Big money? I have a friend who has sunk that kind of money just in tires for slot cars. Heck, for what some people spend for a custom HO track they could become the Parma of HO. Forgive the long tangent. My point is, if HO N20 ever gets off the ground, motors should not hold it back. I'm certainly enjoying the topic, has anyone of you folks fiddled with the N30 motors? I jammed one in a Tyco chassis a year or so back...thanks! I've done some building with N30 motors. Stout little critters with gobs of power. Might be great with magnetic traction assist, but way too much omph for the nonmagnetic braid tracks that we race upon. My point is, if HO N20 ever gets off the ground, motors should not hold it back. If you are serious about those kinds of numbers, and that kind of investment, you should speak to the Cronins at Viper Racing. Dan has partly-developed a racing N20, and is quite a long way into the process. But the project is on hold because the interest does not seem to be there. I contacted several groups who race the Mega-G+, where the concern is that the lack of replacement motors will soon become an issue, but could not get any to commit to buying even $500 worth, despite Viper's deservedly stellar reputation for producing cracking stuff. I believe that Rich D spoke to the gravity guys, with similar results. There is of course already a chassis that uses braids and N20s, the SL and BW family of chassis from HWP. I contacted some owners and builders of these to tell them of the new motor. Whilst there was interest, not enough to invest in what Dan would need to see to get the project over the line. Maybe you and he are each the guy the other is looking for? My concern is that while you can always get N20 motors you can't necessarily get the same N20 motor. The bag that the motors that I ordered came in was marked Fashion Worlds Micro motor 9457. A Google search for Fashion Worlds Micro motor did not turn up the same type of motor. A second search for Micro motor 9457 turned up a couple of hits for the same motor from a different supplier, but they had run out. I still have not found out if the HOST motors are N20s. I am not convinced that a race series where the motors are a total crapshoot is going to work out. A standard motor is what is needed. If you want to get motors from a Chinese company you would probably have to order at least a thousand of them, but probably the number would be as high as ten thousand, that would take a big investment. You might get the motors for a buck each and resell them for $2-3 or maybe more, but it would still take a while to break even. If that did not work out you would end up dumping the motors on eBay. That is in line with what I was saying earlier. One just cannot trust the motors are the same. Viper are offering to end the crapshoot, but the gravity guys who use N20s were not interested when you approached them, right? The investment required to produce a series of standard N20 motors is probably modest compared to what folks -- including myself -- have invested in tracks and equipment over time. Sure, everybody is waiting for someone else to go first, but all the whining (whinging) about the lack of motors isn't appropriate. If you want something bad enough you pony up. And all those folks who have been frustrated trying to find good motors can buy them off you at a 300% markup. That is what's called a business opportunity. Myself, I haven't found motor availability to be an insurmountable problem. I've bought some duds trying to find appropriate motors. When I did find a good motor I spent some time and money on eBay and Amazon buying a supply. That worked. Historically I've been disconcerted by the lengths people have gone to trying to cherry-pick motors. Some have bought hundreds of T-Jet armatures trying to find a few that perform markedly better than the rest. 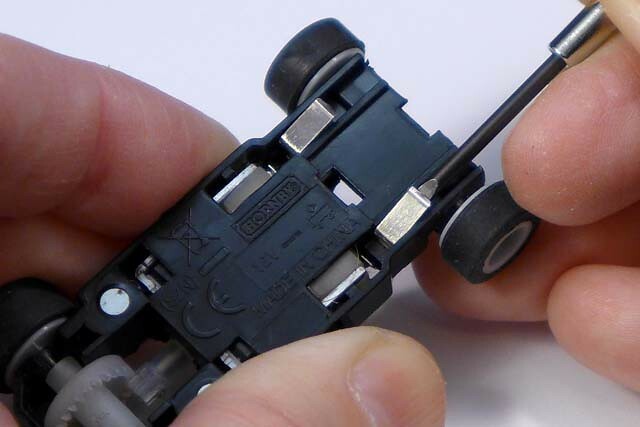 My perception -- not backed by any statistical research -- is there is more consistent quality in any one spec of N20 motors than is typical in slotcar motors. Leastwise, I have never had to throw away any of my preferred spec N20 motors because they were dogs. I can't say that for the open-frame Tomy Turbo motors I used to rely on for my Rattler cars. I have probably at least 50 of them that couldn't make the scratch. Fact is, the Rattler series has pretty much come to an end because I can't get a reliable supply of good motors. More than once I've thought of putting out a motor spec for bid, just so I can get a reliable supply. But I've never been motivated enough to actually create a spec and solicit bids. Which shows I've not been serious, and all I've said about the subject is little more than speculation. So we're still waiting for me, or somebody else, to get off their duff and get some numbers. Until then we are just waving our hands.